The most destructive earthquake ever recorded in the eastern United States occurred near Charleston at 9:51PM on August 31st, 1886. The quake was felt by two out every three people living in the country! Estimated at a 7.3 magnitude (more powerful than the Haiti earthquake in 2010) the shock lasted about a minute. 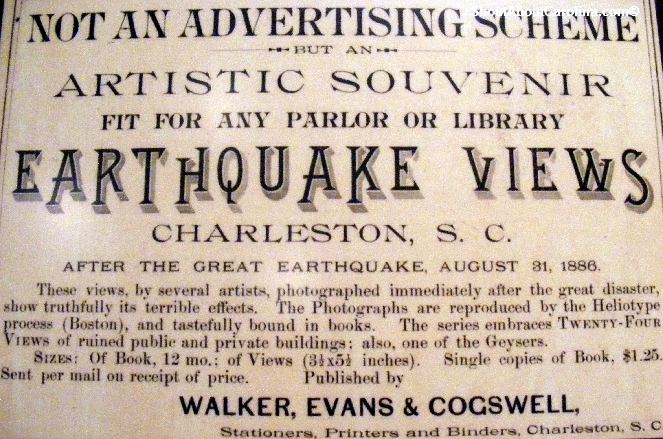 The following historical data, pictures and quotes are from the SC State Museum exhibit dedicated to the 125th Anniversary of the Great Charleston Earthquake and the “Faults and Fractures, The Medical Response to the Charleston Earthquake of 1886” article on the MUSC Waring Library website. More than 100 people were killed and almost every building in Charleston was damaged. Charlestonians suffered the most psychologically given the 300 aftershocks taking place over the next 3 years. The earthquake triggered many strange afflictions, even in cities far from the epicenter. •	Maine: The captain of a schooner off the coast saw “black wall” rising on the water, a mighty wave that lifted the ship to a fantastic height. The schooner was buried in a mountain of foam, its sails torn off and its mast snapped. •	North Carolina Mountains: Flames shot from caverns, leaving behind a cloud of smoke that smelled like burning coal. Massive rocks crashed down into the valley. •	Brooklyn, New York: A telephone operator thought he was having a heart attack when all the plugs on his switchboard popped out of their sockets. •	Terre Haute, Indiana: At a minstrel show the galleries swayed, and one man was thrown out of the balcony; he saved himself by clinging to a railing. 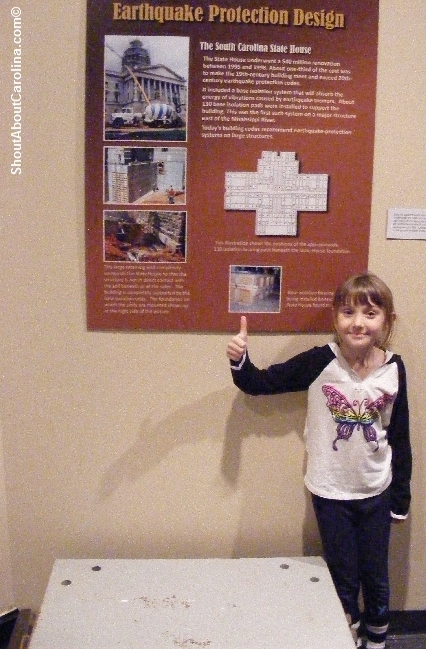 •	Dubuque Iowa: The audience in the opera house stampeded, thinking the building was about to fall. 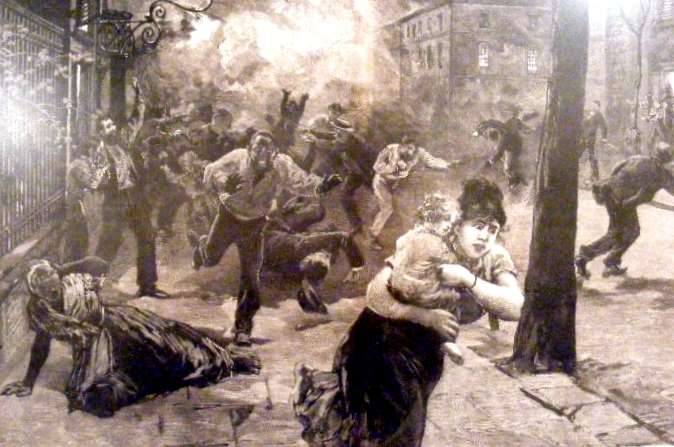 "People ran through the streets...bare feet cut by broken glass and brick shards. Fires raged across the city." •	Dorchester County: Every structure in town was damaged. 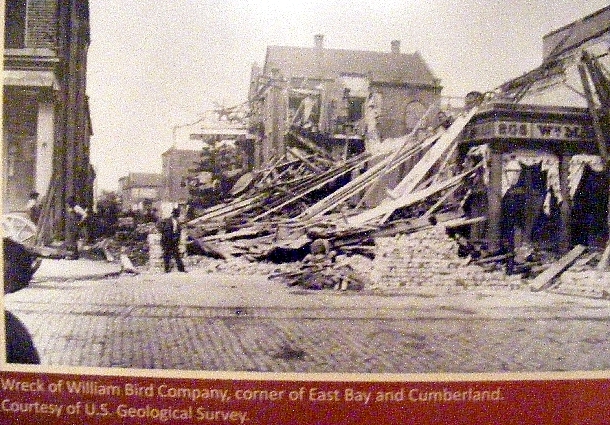 “…the structure seemed to dance up and down…The doors and ceilings were warped and twisted; the timbers groaned and crackled; the chimneys crashed at their bases, sank downward, carrying fireplaces, mantles and hearthstones through the floors through the ground below.” U.S. Geological Survey final report. At present day Colonial Dorchester Historic Site, the ruin of 1719 St. George Anglican Church tumbled to the ground. A chuck of the bell tower flew through the air and landed 35 feet away. •	Horse Creek, Aiken County: A train pulling stock cars plunged off the tracks into 40 feet of water. The fireman was killed and four horses drowned. Other animals kicked holes in the cars and swam to safety. •	Adams Run, Charleston County: 20 feet high geysers covered the ground hip-deep with water. •	Ravenel, Charleston County: The ground broke open for 2.5 miles. A man trying to reach his grand-children was cut off by a jet of water. •	Columbia, Richland County: The Congaree River threw up 10 foot waves. Within days almost everyone in Charleston abandoned his damaged home to sleep outside, in parks, cemeteries, backyards, on buses, ships, ice wagons, and railroad cars. Ships in the harbor became refugees for the homeless. By September 3rd, 40,000 people were tenting and encampments bloomed on every piece of open ground. Many families returned to their houses only to flee back when aftershocks struck. At first black and whites shared the camps, but soon whites moved away from integrated areas like Washington Square Park and congregated instead at White Point Garden by the Battery. The state government never provided relief money or supplies. After more than a week the city began to erect wooden shelters and substantial tents sent by other states and the U.S. military. • Within days a large number of tourists from as far away as Boston came to see the wreckage. Railroads scheduled a variety of excursions and sometimes donated funds to the relief effort. On September 12, 1550 visitors arrived from Georgia and Florida, 400 of whom stopped to eat dinner in the city’s big hotels. Most wary of the aftershocks got back on their trains and left before dusk. • Businessmen scrambled to serve the tourists: stores offered booklets showing the damage, some sold vials of the brightly colored sand and clay brought up by sand blows. 'Earthquake Views...Not an advertising scheme'...yeah right! When those ran out they filled glass tubes with coffee grounds and red pepper flakes. • One antique dealer ran ads seeking door knockers, candlesticks and other artifacts that survived the quake to sell to “Northern parties”. • Agents for dime museums were said to be in town looking for “earthquake babies” as special exhibits. Some twins born the night of the disaster were nicknamed Earth and Quake. The biggest quake sham of all time! 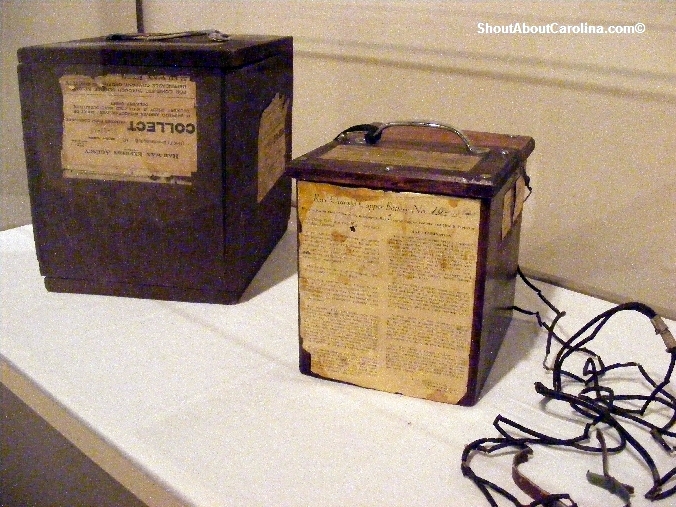 Earthquake Ray-Charged Copper Battery made by J. M Brasington, Benetsville South Carolina, discoverer of Rays, 1890. The maker, J.M. Brasington, contends that the battery will intercept and store earthquake rays from 10,000 miles away, and when connected to the body can cure a many illnesses. “When taking the hot or cold rays, the wrist band must be on the right or left wrist…Copper traps must be laced to slipper soles, stocking or bare feet. When wrists and straps are properly fitted you will get the Quake and Battery rays even if sitting on rubber, glass, riding in automobile, boat, lying on bed or couch. 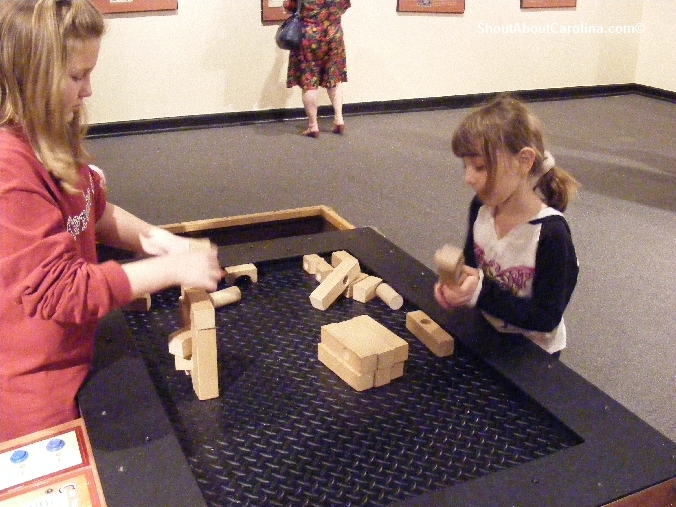 Test your engineering and architectural skills at the large shake table to see whether you can build an earthquake proof building. Check out the one of the base isolation pads used in the renovation of the SC State Capitol in the late 1990s. About $13 million was spent to make the building meet and exceed 20th century earthquake protection codes. A new base isolation system was created to absorb the energy of vibrations caused by earthquakes. 130 base isolation pads were installed to support the building, a first for a major structure building east of the Mississippi River. Nowadays computers monitor any shifts in the ground through these isolators. The SC State Capitol was the first major building east of the Mississippi River to undergo a massive earthquake prevention renovation. 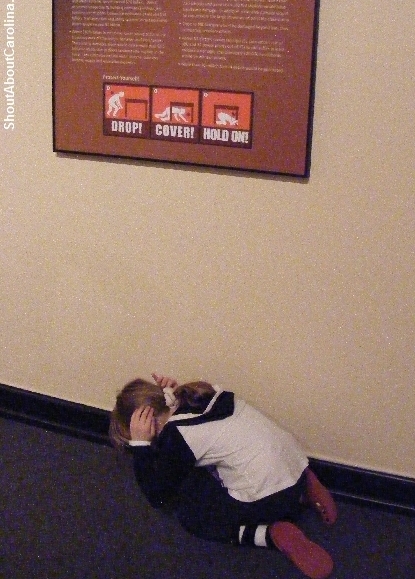 Learn how to be safe when the earthquake strikes: drop, cover and hold! Read “Upheaval in Charleston: Earthquake and Murder on the Eve of Jim Crow” by Susan Millar Williams and Stephen G. Hoffius, a gripping account of the natural disaster and turbulent social change in Charleston following the Civil War. 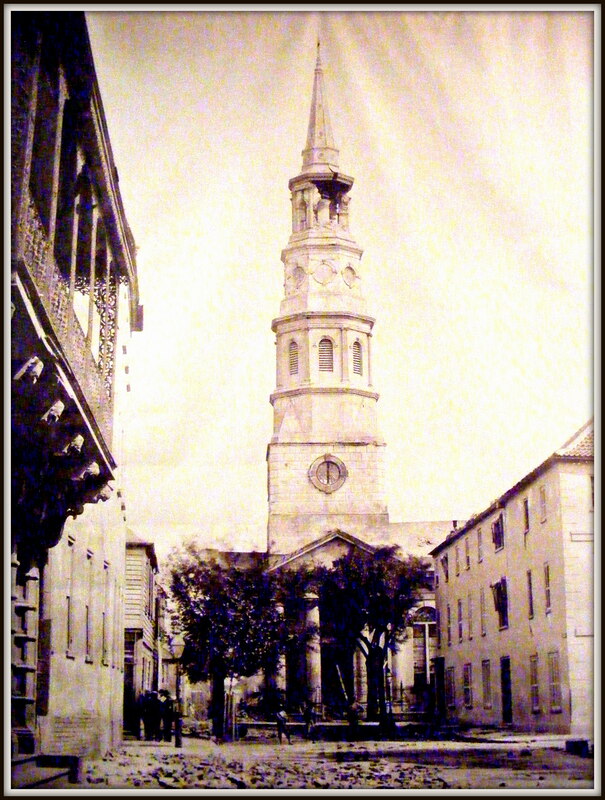 The book features Francis Warrington Dawson, editor of Charleston’s News and Courier, who rallied Charlestonians after the earthquake struck by organizing the relief committee and receiving contributions that helped rebuild the city. Hailed as a hero in the aftermath of the earthquake, Dawson was denounced by white supremacists and murdered less than 3 years after the disaster. His killer was acquitted after a sensational trial that unmasked a Charleston underworld of decadence and corruption. You have until end of April 2012 to see the remarkable Body Worlds Vital exhibit at the SC State Museum. Astronomy lovers check out the incredible collection of historical telescopes, donated by Robert B. Ariail.